It’s almost never wise to speak in absolutes when it comes to Apple, since the company has a long history of changing its collective mind. There is one thing we can say with certainty, however: Apple will never release an iPhone with microSD support. Apple makes far too much money by forcing customers to cough up more cash for higher-margin models with more storage to ever let that cash cow die. But there are things you can do to mitigate the burn. 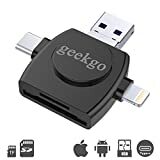 Instead of paying extra for more storage, pick up a Geekgo Memory Card Reader. Simply plug it into the Lightning port on your iPhone and you can insert a microSD card or even a full-size SD card. Then offload all the photos and videos that are taking up space, and you’re good to go. 4 in 1 Card Reader – Lightning adapter for iOS devices (iPhone & iPad); USB C adapter for Type C devices (Samsung Phone & Macbook & Chromebook);Micro USB adapter for Android Phone devices; USB adapter for Computers/iMacs. Easy to Manage Data -You can manage all your Data and Files directly on this card reader (Create, Copy, Move, Delete, Rename, etc.). Free App iUSB Drive – iPhone / iPad need to download free app named “iUSB Drive” from App Store.Please see our user manual for detail.